This article was contributed by the Korea Forest Service. ― Ed. Their Global Tiger Recovery Program’s main objectives include efficient supervision and protection of tiger habitats, eradication of illegal poaching, smuggling and trading of tiger-related merchandise, landscape management and cooperation in preventing international illegal trading, cooperation of the local communities, improvement of tiger and tiger habitat management methods and restoration of tiger populations. When summits between South Korea and China took place in Beijing in 1994 and 2005, the Chinese government donated a Siberian tiger and tigress to commemorate bilateral diplomatic ties. The tigers have been cared for by the state-run national arboretum in efforts to preserve them within Korea. During the 2011 Korea-China Conference on Forestry Cooperation, the two nations once again agreed upon consistent mutual cooperation in the preservation of Siberian tigers and for that Korea was given an additional pair. Despite such efforts, the tigers Korea accepted from China failed to mate until 2011, when a Korean expert on tigers personally visited the site in China to pick out a robust-looking pair which then finally succeeded in delivering cubs. This success displays promising hopes of preservation and restoration and hence holds a cheerful meaning for Korea. As such, the Korea Forest Service is planning to create, develop and maintain a forest habitat for tigers ― as similar as possible to that of their natural habitat ― within the soon-to-be completed National Baekdu-Daegan Arboretum in Bonghwa, North Gyeongsang Province. Baekdu-Daegan, a former migration route of Siberian tigers, is regarded as the most ideal for creating a “Tiger Forest.” The mountain range is South Korea’s core ecological axis, with numerous and various types of life and species. Baekdu-Daegan provides a passageway through North Korea and eventually to tiger habitats in Russia and China, allowing tigers to potentially migrate to South Korea and contribute to the recovery process. Currently, however, due to the division of South and North Korea, it is realistically unreasonable for the tigers to migrate along this path all the way through to the Demilitarized Zone. As such, experts voice their opinion that although natural restoration is favorable, it may be wiser to produce results through off-site conservation by continuing to support preservation institutions and agencies. 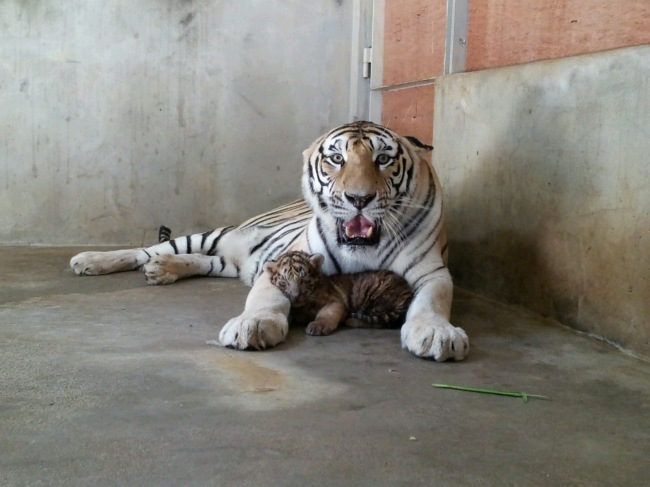 Bae Joon-kyu, an expert at the Baekdu-Daegan Arboretum, said that organizations affiliated with “off-site conservation” must make efforts to secure the number of tigers by artificial reproduction and to maintain tigers’ genetic diversity. He further stated that the Bonghwa region is a fitting and optimal choice in terms of forestry type and climate.